I've been a little busy with life & work, so haven't had much time to post. From my home to yours, Merry Christmas! If you follow me on Instagram, you know that a few of weeks ago I went with a friend picking fresh blooms at Country Cut Flowers. What a beautiful way to spend the morning...I could get very used to this! When we arrived we were given a bucket of water, some shears & instructions on how to cut. Then we were free to roam & pick as many as we wanted based on our ticket pricing. If you live in the GTA or York Region... I highly recommend going. 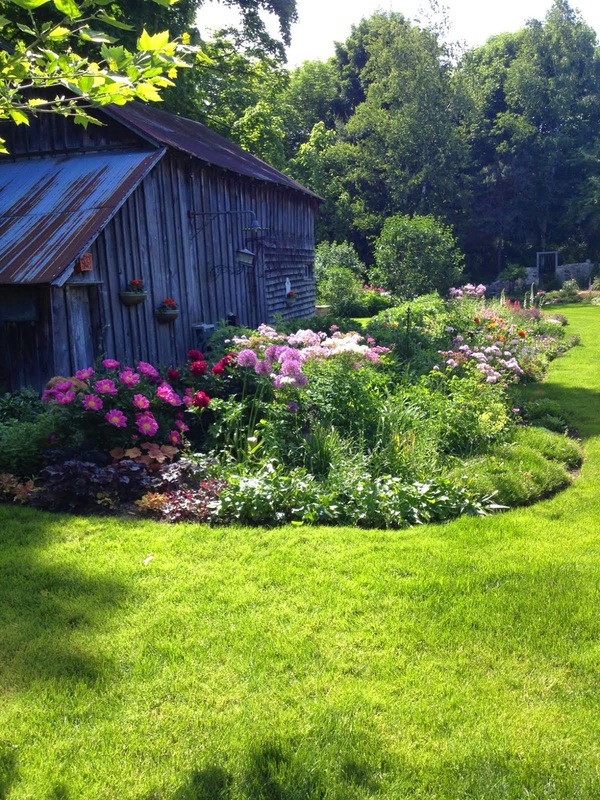 We had fun just picking flowers but it's also a perfect place for photographers, wedding parties, engagement or family photos... the list goes on. They also offer weekend workshops. Newmarket so check them out if you're a local! So here we are on the top floor of our little flip... the last room to reveal. It's hard to believe this little loft once had bright pink walls with light blue (very dirty) carpet. 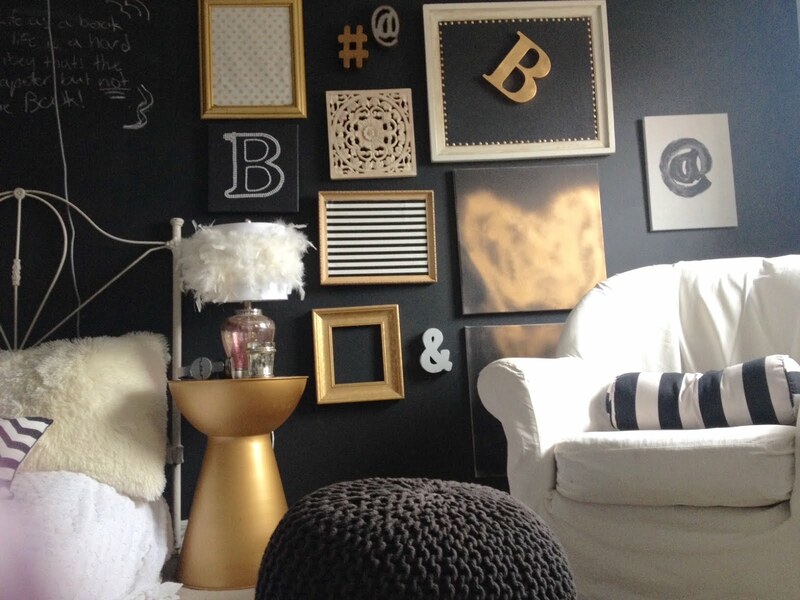 Here's a little peek at the before & after of the loft. And this is looking the other direction. You can see from the photo below that the closet used to be on the other side. We flipped it to accommodate the bathroom. There wasn't a washroom on this level, but we knew that this would be a big selling feature if we put one in... a three-bedroom, two-bathroom home will always sell faster & for more. The kitchen was directly below this side and made it easy to run the plumbing up the wall. these were a big savings to our budget. The finishes in this bathroom are similar to the kitchen and bathroom on the main floor. In case you're wondering where the toilet is, it's to the left of the photo above, and tucked under the slanting roof line. I took hundreds of photos and for some reason don't have one of the toilet in this bathroom. You can see we used slate coloured tiles on the floor in a brick pattern, and subway & hex tiles in the shower.... all from Home Depot. 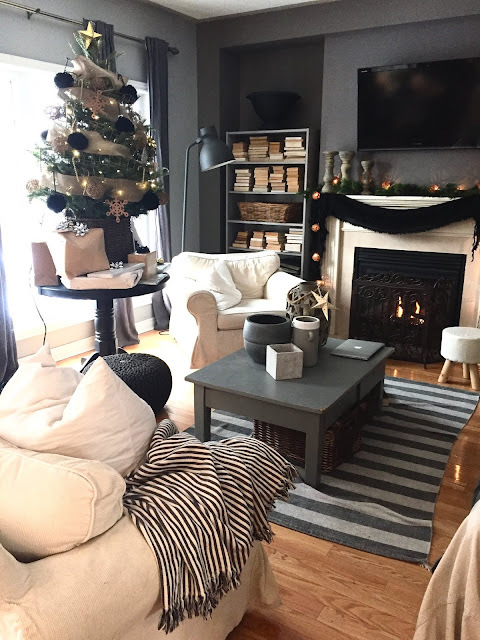 Most of the accessories are from HomeSense and the lights throughout the house are from Lowes. Construction & cabinet making on this home were all done by MVH Custom Carpentry. So that's it for our little flip photos. If you are thinking of investing in real estate, the Kitchener, ON area is still very good and much cheaper than the GTA... at least right now. Things may change when the high speed train goes in! This sweet little bathroom wasn't very sweet when we started this flip. It was a real eyesore with light blue tile running up half the wall, two mis-matched vanities flanking the toilet and a fibreglass surround shower with glass doors... not the most stylish. I had to get the best look in the most economical way in this bathroom because it was the last room that was done on the flip. We didn't have much money left or should I say we had NO money left. 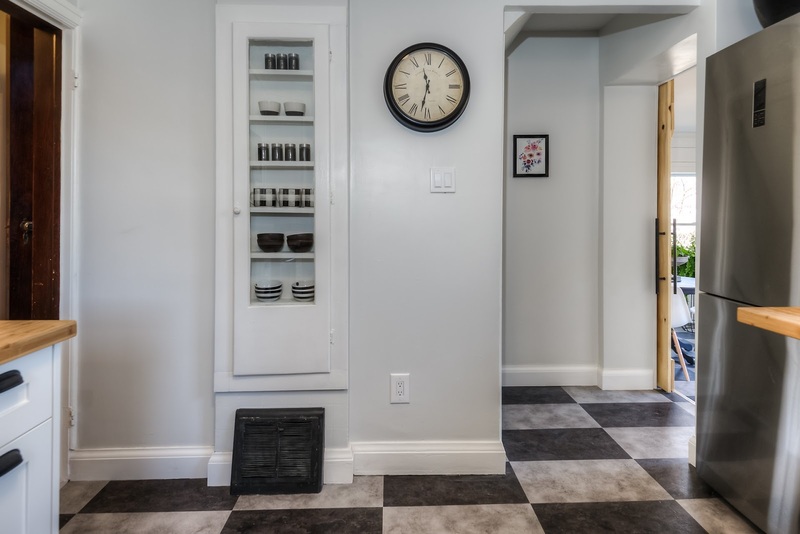 With that in mind, I reused a vanity & sink, and to save time & money, I chose a black & white hex vinyl flooring from End of the Roll which was perfect in the space. A big pet peeve of mine is to have the toilet as the focal point in a bathroom. This bathroom was in the middle of the house and was seen from most rooms so moving the toilet was an added expense but needed to be done for the sake of good design. 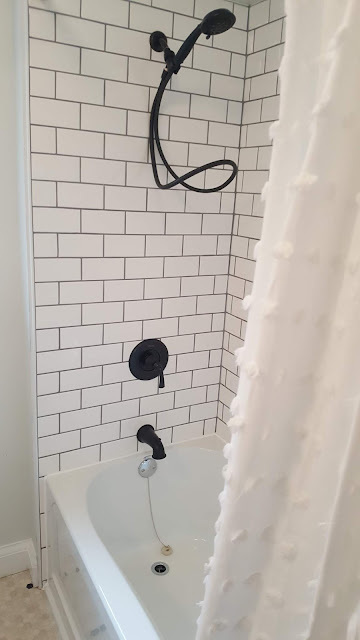 In keeping with the modern farmhouse theme & to keep the rooms cohesive, I went with white subway tile from Home Depot to surround the tub...a look that most buyers (male or female) will like...an inexpensive but classic look and very on trend. When staging bathrooms I like to keep things crisp & white (bathrooms should feel clean) so bath towels, bath mat & shower curtain are all white. 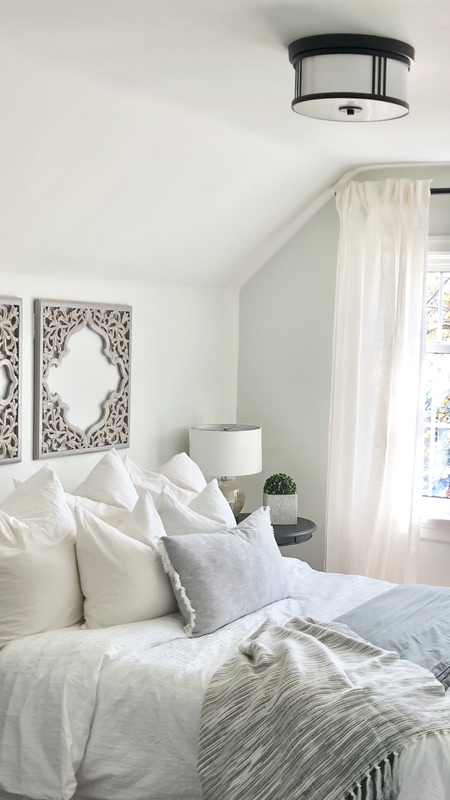 I used the same wall colour in this room as I did throughout the house... Blizzard Fog by Valspar which has a hint of gray in it. Another little trick I do is place French soaps (sometimes they give off a pretty smell) & Turkish towels in bathrooms. This gives the bathrooms a hotel feel & makes them feel luxurious. All accessories in this bathroom are from HomeSense (including the French soap) and the bath towel hooks are from IKEA. The light fixture, tub & faucets were all purchased from Lowes. The round mirror is from Bouclair. It's hard to believe this is the same bathroom...what a transformation! What a difference it makes to keep things white and bright! One more reveal coming soon... the loft and master bathroom. 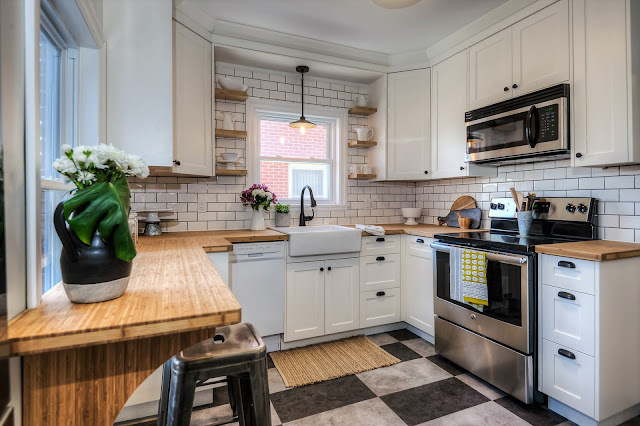 If if you missed the other reveals, you can check out the main floor here & kitchen here. Construction and cabinet making on this home were all done by MVH Custom Carpentry. from the flip... which I think you will agree is quite a bit different than before (see below). As you can tell, there isn't a lot of room in this space. To complicate matters, one wall had a large window and an entrance, another wall had an entrance & a third wall had a built-in. The wall space was roughly 10ft x 7ft, and we had to accommodate a fridge, stove & dishwasher... not an easy space to design. To do this, we had to go with a small dishwasher & fridge... we also bumped the wall back into the bonus room to accommodate the fridge. 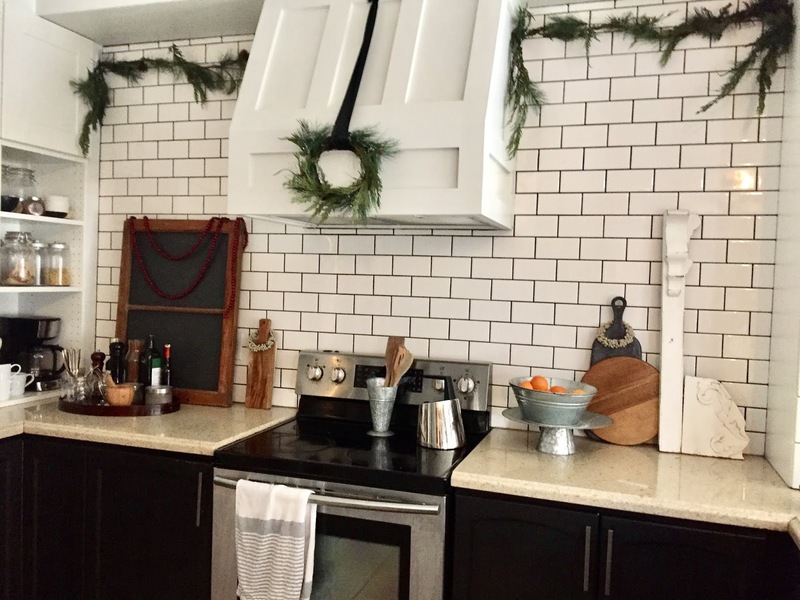 I went with a modern farmhouse theme in this kitchen with classic white Shaker cabinets (to appeal to most buyers), bamboo counter tops, a farmhouse sink & kept hardware & fixtures black. Construction & cabinet making for this home were all done by MVH Custom Carpentry. We all know that eat-in kitchens are a big plus when you are selling and since the window looks out onto the garage & walkway, we extended the counter over the window. 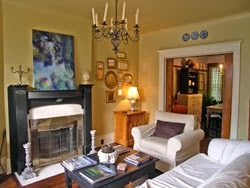 This allows for extra seating and also (believe it or not) makes the space feel bigger. I can't take credit for this idea...I saw this on Fixer Upper with Joanna Gaines ... brilliant idea! Another thing I did to make the space feel larger was put a very small white dishwasher in the kitchen. With all the cupboards being white the dishwasher just blends in now and doesn't stand out. If I had put a stainless steel dishwasher here, the eye would have been drawn to it. This little space off the back of the house... the bonus room... was an add on to the original house by the previous owner. It needed quite a bit of work.. the door was moved to accommodate the fridge and allow better access to outside. Also, one window was removed and an electric fireplace was put in. 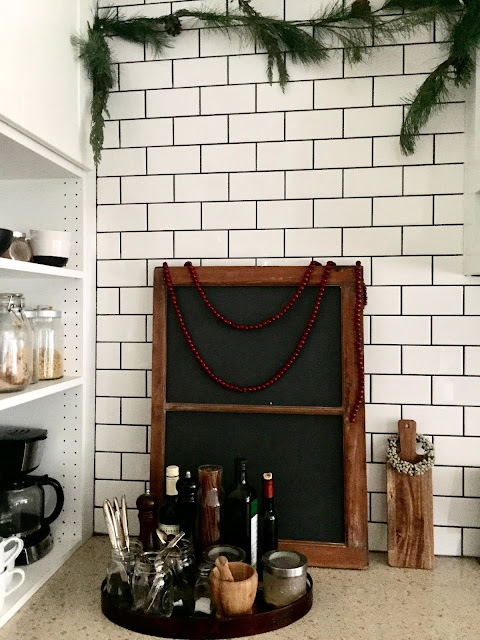 To elevate this space and make it appear more current, I decided to add shiplap (painted in Simply White by Ben Moore). 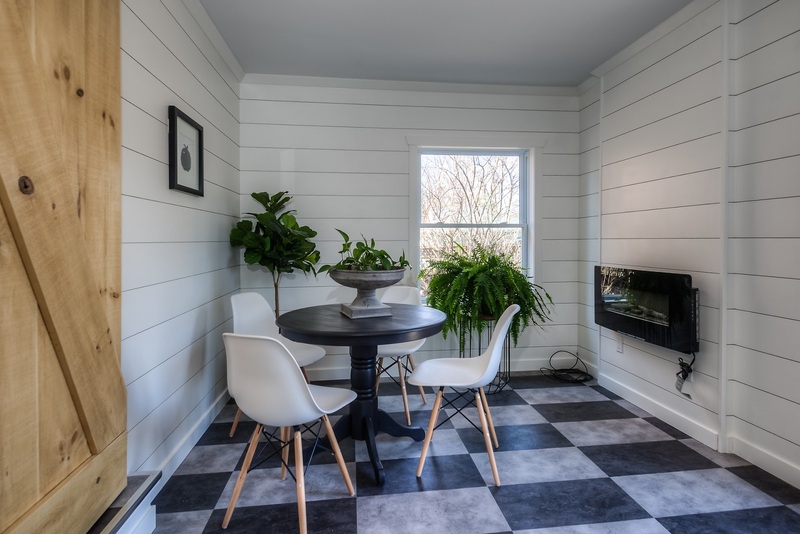 This really changed the space and not only gave it an updated look, but the horizontal lines of the shiplap made it appear larger. Because this room is off the kitchen I wanted it to feel like an extension of the kitchen. I kept the floors the same in both rooms and put an eating area in one corner. I also staged the other half of the room, which leads outside, as a mudroom to make this small room multi-functional. Multi-functional rooms are a must in small spaces. The new owners can add hooks and a bench if they want to make it more permanent. 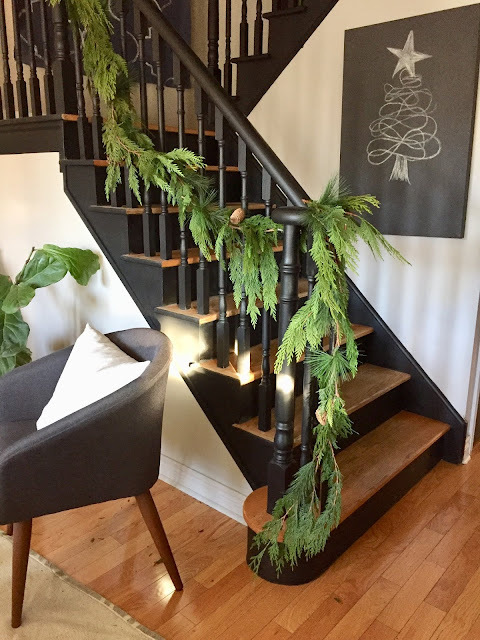 In keeping with the modern farmhouse theme, I chose an industrial light from Lowes and a barn door. (All photos are mine taken with my iPhone except where noted). More photos of the main floor bathroom coming soon! If you missed the living room & main floor bedrooms you can see them here. 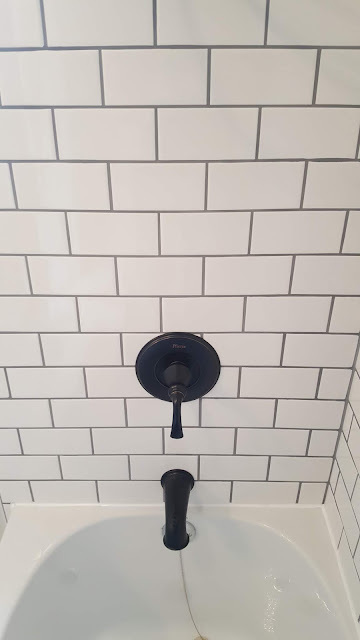 Main floor bathroom reveal is up next!